Authors for the Philippines is an online auction set up to raise money for the Red Cross’s Typhoon Haiyan Appeal. It features donations from loads of authors, illustrators, editors and agents. Bid on signed and dedicated books, manscript critiques, character names, author meetups, school visits and lots more. I’ve donated a chance to be my next book – as a band name! 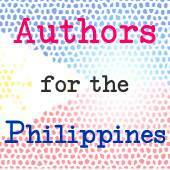 Browse and bid at Authors for the Philippines.